14" 1 - 0 - Bellerin's cross lands at the feet of Lacazette in the penalty area. He still has plenty to do when he receives the ball and he shifts the ball past Alonso before finding the roof of the net from an acute angle. It's a brilliant finish from the Frenchman. 39" 2-0 : What a moment for the Arsenal skipper! It goes in off his shoulder but he will not care one bit after what he's been through with injuries. Torreira whips the ball to the far post where Kolasinac heads the ball down to Sokratis. It's centre-back to centre-back as Sokratis lofts the ball into Kosicelny, who beats the offside trap to score off his shoulder for his first goal since his return! Elneny 5, Iwobi 5, Maitland-Niles 5. Arsenal have won consecutive home games against Chelsea in all competitions for the first time since February 2004. Chelsea have only won one of their last seven away London derbies in the Premier League (D2 L4), winning 1-0 at Crystal Palace in December. Arsenal are unbeaten in 13 Premier League London derby matches at home (W10 D3), winning the last six in a row. Arsenal have won more points in seven games against 'big six' sides this season (8) than they did in the whole of the 2017-18 campaign (6). Chelsea's first shot on target didn't come until the 82nd minute, from Marcos Alonso. 63% of Arsenal striker Alexandre Lacazette's Premier League goals this season have come in London derbies (5/8). 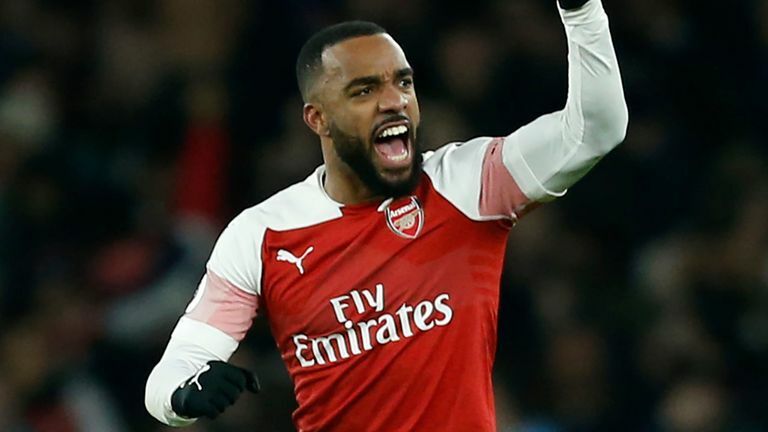 Only Arsenal teammate Pierre-Emerick Aubameyang (6) has scored more Premier League London derby goals this season than Alexandre Lacazette. Arsenal: Leno, Bellerin, Sokratis, Koscielny, Kolasinac, Xhaka, Torreira, Guendouzi, Ramsey, Lacazette, Aubameyang. Subs: Cech, Elneny, Ozil, Maitland-Niles, Iwobi, Monreal, Mustafi. Chelsea: Arrizabalaga, Azpilicueta, Rudiger, Luiz, Alonso, Jorginho, Kante, Kovacic, Willian, Hazard, Pedro. Subs: Caballero, Barkley, Giroud, Hudson-Odoi, Christensen, Emerson, Ampadu.